Anthony Harris, associate professor of educational leadership and counseling, will discuss “Growing Up in the Segregated South” on Wednesday (Oct. 27), as part of the Grassroots Speaker Series. The speech will be held at 5 p.m. in the Olson Auditorium, in Academic Building 4. A reception will follow immediately in the Student Advising and Mentoring Center, in AB4 Suite 210. Harris, who grew up in Hattiesburg, Miss., during the Civil Rights Movement, was one of five teenagers who chose to integrate Hattiesburg's W. I. Thames Junior High School in the fall of 1966. An activist, he participated in marches, demonstrations, sit-ins, boycotts, and voter registration drives in 1964, the year now known for its Freedom Summer, as a pre-teen. The speaker series is sponsored by the SAM Center’s academic support programs, Elliott T. Bowers Honors Program, International Hispanic Association, Women United and Omega Delta Phi Fraternity, Inc. Need research help on the go? Then stop by Librarians on Location. It's research help where you are, every Wednesday and Thursday, from 10 a.m. to 2 p.m., beginning on Oct. 27. SHSU Librarians will set up a portable Reference Desk with wireless laptops, research handouts, and promotional information about Newton Gresham Library. Students can stop by to receive assistance in finding sources for papers and projects, learn how to navigate the library Web site, use the library catalog to find books, and get hands-on help in searching the library's databases to locate articles.
" The Newton Gresham Library is committed to finding better ways to serve the SHSU community,” said Ann Holder, director of library services. “Librarians on Location is an outreach program designed to bring Library services to the students where they congregate. “ The idea is to not only answer questions and assist in research, but to encourage students to go use the Library resources and librarians as their primary sources of information." On Wednesdays, Librarians on Location will be located in the Writing Center and in the Academic Building 4 Computer Lab, in Room 203, and on Thursdays, in the Smith-Hutson and Lee Drain foyers. The Librarians on Location program will run through Nov. 18. For more information, call the Newton Gresham Library Reference Desk at 294-1599. Artist Trenton Doyle Hancock will speak about his work on Thursday (Oct. 28) at 3:30 p.m. in the Art Auditorium, in Art Building E Room 108. A young artist from Paris, Texas, Hancock’s work includes drawings, mixed media installations, and performances and has been shown around the globe. The imagery in his work includes characters such as “Mound #1,” “Torpedoboy,” “The Vegans,” and “Painter” and “Loid” who act out narratives derived from a complex personal mythology Hancock has developed. This semi-autobiographical saga weaves allegory, word play, satire and humor into an inventive, multimedia collage. Hancock studied art at Texas A&M, Commerce and did graduate work at the Tyler School of Art in Philadelphia. He has received grants from Artadia Houston, the Joan Mitchell Foundation, and the Dallas Museum of Art. Exhibits include the Whitney Biennial in New York in both 2002, and 2000, the Lyon Biennial in Lyon, France, and the Istanbul Biennial in 2003. Hancock has had solo exhibits at the Cleveland Museum of Art; Museum of Contemporary Art, North Miami; and the Glassell School of the Museum of Fine Arts Houston. He is represented by Dunn and Brown Contemporary Gallery in Dallas, and James Cohan Gallery in New York. The free lecture is sponsored by the Gaddis Geeslin Gallery, and is open to the public. Sam Houston State University president James Gaertner and Mrs. Gaertner will host the children of faculty, staff and students for the annual President's Halloween Carnival on Oct. 28. The event will be held at the Gibbs Ranch from 5:30-7:30 p.m., and will feature a haunted house, hayride, games, treats, pictures with Kooter the goat, a costume parade, a disc jockey and much more. Many student organizations have volunteered to put on the event, including the Honors Program, Kappa Alpha, Tri Sigma, Math Club, Ruth Lane Mathematical Society, Kappa Delta Pi, and agriculture. Other groups or individuals interested in helping can contact Maggie Babcock at mbabcock@shsu.edu or 936.294.3415. The department with the highest percentage of donors will all receive a free 10-minute massage. Blood is at a shortage, and all donations benefit the American Red Cross. For more information, call Dan Kennedy, program coordinator for Student Activities, at 936.294.3466, or Tina DeAses, assistant director for wellness programs for Rec Sports, at 936.294.3658. The Office of International Programs will give both foreign and American students the opportunity to meet for refreshments with “International Coffee Hour” on Thursday (Oct. 28), from 4-5 p.m. in the Lowman Student Center Kat Klub. “ It’s just a wind-down time for them (international students) to visit with friends they already have and meet some other international students they haven’t met before,” said Donna Rogers, OIP coordinator of operations. Cookies, fruit, punch, tea and coffee will be served, and students can play on the ping-pong and pool tables for free for the hour. International Coffee Hour is open to all students, faculty, staff and “anybody who would like to come and get better acquainted with some of our international students,” she said. For more information, call 936.294.4737. Jose Kozer, a well-known Cuban poet, will read some of his works on Monday (Oct. 25) at 2 p.m. in Evans Building Room 105. He will also hold another reading on Tuesday at 5 p.m. at Khaldi's Coffee House. The readings are sponsored by the department of English and foreign languages and Sigma Tau Delta, the international English honor society. For more information, contact Rafael Saumell at 936.294.1449. For those who will not be attending the Eastern European Tour sponsored by Travel with SH in conjunction with the School of Music, the school will host a preview concert on Tuesday (Nov. 2), at 7:30 p.m. in Killinger Auditorium. SHSU alumna and native Houstonian Melanie Holliday will serve as a featured performer at the concert. “ We will be playing all the pieces that will be played in Europe in addition to playing with all the soloists who will perform in Europe,” said Veronica Wilson, graduate assistant in orchestral studies, “which include, Melanie Holliday, Kristen Hightower and Andrew Wilson. “ It (the purpose of the concert) is so that people not going on the trip can enjoy the program that we have worked hard to put together,” she said. The School of Music group and Holliday, as well as those taking the Travel with SH tour, will leave for Budapest, Hungary, their first stop on the tour which will also include Vienna and Prague, that Friday for the 10-day trip. Holliday, “a real star in Vienna and Austria,” as well as being well-known in Japan, has approximately 20 CDs to her credit, according to Carol Smith, director of orchestral studies and professor of music. Tickets for the concert are $8 for adults and $5 for senior citizens, children 12 and over, and non-SHSU students. Children under 11, as well as SHSU students, faculty and staff, are free. Melissa Wynn, in association with the SHSU theatre and dance department, as well as the music department, will present her solo work entitled “Return to the Land” on Oct. 29-30 in the University Theatre Center’s Showcase Theatre. Don Childs, a nationally recognized lighting designer and assistant professor of set and light design, along with Thomas Couvillion, visiting assistant professor of music, and filmmaker George R. Larkins, III, have all contributed their own creations of original set design, music and film clips respectively to the production. “ Return to the Land” will tour nationally and internationally following its premier in Huntsville. Tickets for the 40-45 minute presentation are $8. For more information contact Wynne at 936.294.1588. Undergraduate-level tutors, Jennifer Sanders, Kacey Grimes and Melanie Machost will lead the discussion on Tuesday (Oct. 26), at 4 p.m. in the Writing Center. On Wednesday (Nov. 3), the center will wrap up its workshops for the semester with “Writing Application Essays and Statements of Purpose for Graduate School,” at 4 p.m. in the Writing Center. Writing Center director Diane Dowdey and undergraduate tutor Penny Pitrucha will relate the general principles for writing convincing and persuasive statements that review undergraduate work relevant to a graduate program, as well as discuss future plans. The center is located in Wilson Building Room 114. For more information, call 936.294.3680. Catherine C. Odasz, a 2003 College of Business Administration accounting graduate and master’s degree candidate, has won a $5,000 award from the prestigious Texas Business Hall of Fame Foundation. Odasz and 12 other outstanding Texas business graduate students will receive their awards at a foundation luncheon in San Antonio and will be honored at a dinner that evening. 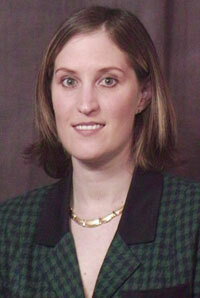 As an undergraduate at the College of Business Administration, Odasz was first in her class of 705 students. She received several scholarships and holds an overall grade point average of 4.0. A member of the Golden Key and Beta Gamma Sigma honor societies, Odasz currently serves as a College of Business Administration ambassador and is a student member of the American Institute of Certified Public Accountants and the Texas Society of Certified Public Accountants. She is employed full-time as an account executive with Robert Half Management Resources, specializing in the placement of senior-level professionals within the financial information industry. The Texas Business Hall of Fame Foundation was founded in 1983 to recognize and encourage the values of entrepreneurial spirit, personal integrity, and community leadership. Charlie E. Amato, a 1970 COBA graduate, is the foundation’s current chair. Several Sam Houston State University faculty and staff members recently earned certificates from the Northeast Texas Consortium (NETNet) Center for Educational Technologies. Earning this certification indicates that each participant was assessed according to a 41-point documented standard of minimum competence, and their performance was deemed to meet or exceed this standard. The Northeast Texas Consortium (NETNet) offers this certification to persons demonstrating proficiency in the skills required to operate the NETNet interactive videoconferencing system. These state-of-the-art videoconferencing systems are present on the 15 college and university NETNet member campuses across east Texas. Certificates were awarded to James Van Roekel, director of academic instructional technology and distance learning; Craig Schlicher, programmer analyst; Robert Werling, project coordinator; student Bethany A. Young; and faulty members Phillip Lyons, Greg Gathright, and Carol Hightower Parker.